Do you know where I can read in detail about the actual experiment? I tried the link you provide but could´t find any material there. Interesting! A similar idea I’ve thought about is how to vote in election primaries. If the candidate I like is unpopular, should I vote for them anyway, or vote for one of the more popular ones that I think is best able to defeat the other party? 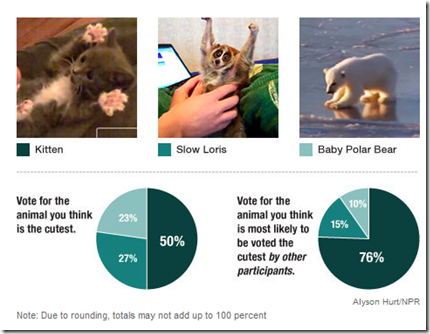 I don’t quite understand this experiment: they ask which is the most likely to be voted cutest, and people have given the correct answer. There doesn’t seem to be any contradiction at all between the two polls.